Control of the money supply is one way that the government keeps the economy on track. It's difficult though, since much of the money in circulation is effectively created by banks, using what is known as fractional reserve banking - they can lend out several times the amount of money they actually have. 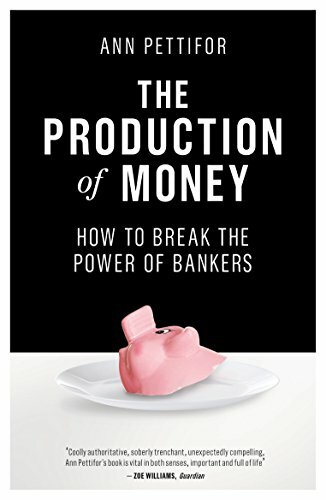 I'm reading this book to see if it has a persuasive argument that curtailing fractional reserve will control the excesses of the financial sector (rather than seeing the problem in changes in the banking profession in last 50 years which have have encouraged risk). There are a couple of things I'd note. Firstly,one might be tempted to see the money created as directly increasing the wealth of the bank. This isn't the case, the bank creates a liability for itself as well as an asset. Indeed, anyone can do the same. Write an IOU for £10, and swap it for a corresponding IOU from a friend. Assuming you are trustworthy, people should be willing to accept these IOU's in lieu of cash. You've just created £20 out of nothing! My second worry is that we might see fractional reserve banking, that is lending out £500 when you only have £100, as something unusual and so not to be trusted. But there's nothing unusual about a bank lending out it's depositors' money - that's its business. So say A deposits £100 in the bank, and lets say it is in the form of gold. The bank lends this to B, who uses it to pay suppliers, but they don't want to hold on to gold - they put it in the bank. So now the bank can lend it to C, and then to D, E, and F (the money being deposited in the bank each time). Thus we have £500 lent out but only having £100 at one time. I hope this book won't put forward such dodgy arguments, in which case I look forward to finding out what it has to say about controlling the excesses of the financial sector.